In the aftermath on the 0-0 draw at Old Trafford on Sunday, the Premier League title race is back to being a tight affair. When the season started, many thought that the brilliant Manchester City would once again win the league by a considerable margin. We can safely say that that hasn't been the case this season, with Liverpool going toe-to-toe with them and even taking a slender lead at this moment. The lead was as wide as 7 points a few weeks ago, but it has been brought down to a single point. And with city having a better goal difference, it even looks like advantage City at this point. For Liverpool the task seems a straightforward one: win all their remaining games and they will become the champion. However, that doesn't seem easy with the fixtures coming up thick and fast until the end of the season. They still have to play local rivals Everton as well as fixtures against Tottenham and Chelsea. The game against Burnley might also prove difficult as the latter have improved vastly from their early season poor form. Fulham and Cardiff will also not give up without a fight, as they would be fighting relegation battles and for them every point will be crucial. Even with results going their way, Liverpool might have to beat Wolves at home on the final day to win the Premier League, which isn't an easy task by any means. Since Man City have a better goal difference and a better squad overall, the only way to finish above City is on points and not by outscoring them. As far as Manchester City are concerned, they need Liverpool to drop one point from the remaining games while they themselves win their remaining fixtures. The task isn't that simple though. The toughest of the remaining games seems to be the obvious Manchester Derby at Old Trafford. Even though the City side are amazing, United woudn't want to lose to their city rivals at home. Tottenham at home is also another notable game in their calendar. 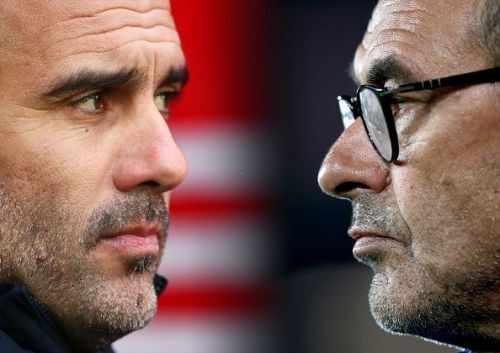 Knowing City they might win both of these games and with relative ease too, but they have dropped points against the likes of Crystal Palace, Leicester and Newcastle this season so we cannot predict the results with any degree of certainty. The experience of winning the Premier League and Pep Guardiola leading the pack means City are just about favourites at the moment. But depending on the next few results, the odds could change in Liverpool's favor as well. It is worth remembering that Liverpool have only lost once this season. If they can rediscover their form quickly enough and get some wins on the bounce, they can expect to be the champions after decades of waiting. Jurgen Klopp knows how to motivate players; having won league titles in Germany with Dortmund, his experience is key to their title aspirations. After missing out on the title the last time around to the same opponent in the 2013-2014 season, Liverpool fans would be hoping they can go one better this time and end the long wait.